Come celebrate the Mostly British Film Festival’s 10th anniversary February 15-22 at San Francisco’s Vogue Theater. It will feature more than 25 films from the UK and beyond. Highlights include Mad to Be Normal, a biopic of controversial 1960s Scottish psychiatrist R.D. Laing, played by Broadchurch’s David Tennant; London Road, based on the sold-out British stage musical; I, Daniel Blake, the top prizewinner at Cannes; and the best of the British New Wave, including Darling and Alfie. Also on the program are an appearance by Downton Abbey’s Joanne Froggatt (Anna Bates), and a free whiskey tasting between screenings. Check mostlybritish.org. 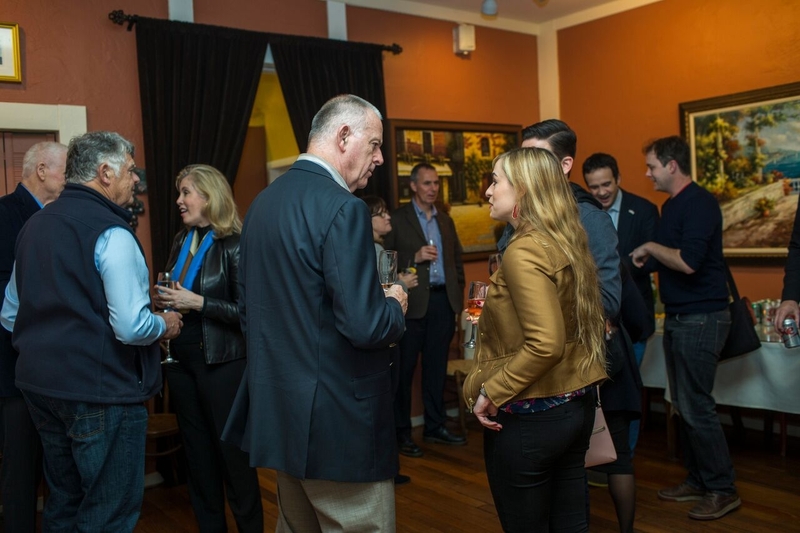 British film fest celebrates in S.F. While March 4’s Oscar Awards will feature a bevy of British nominees (including best picture nominees “The Darkest Hour” and “Dunkirk”), the Mostly British Film Festival in San Francisco got a jump on the golden man with London stars Joanna Froggatt and Sir Bob Geldof, who alighted Feb. 18 at the Vogue Theatre in Presidio Heights for its 10th anniversary season. First-nighters gathered for cocktails at Magic Flute restaurant on Sacramento Street, then strolled to the nearby Vogue, where a packed house awaited a screening of Froggatt’s new film, “A Crooked Somebody,” preceded by her Q&A with Jonathan Moscone, YBCA’s chief of civic engagement. And nobody engages like Moscone: As a theater director he’s mad for all types of drama and is a raconteur of the first order. Describing the fraught romance between “Mr. Bates” and Froggatt’s “Anna” character in “Downton Abbey,” Moscone noted that, for his generation, it held the same rabid interest as “Luke and Laura” from the old “General Hospital” soap opera. Dreamed up by former Chronicle film critic Ruthe Stein with San Francisco Giants General Counsel Jack Bair and Giants EVP Alfonso Felder, this plucky cornucopia of Celtic-language filmography benefits the San Francisco Neighborhood Theater Foundation. The foundation, founded by Bair and Felder, saved the historic single-screen Vogue and Balboa theaters from condo-ization, and also programs the beloved free Film Night in the Park series. 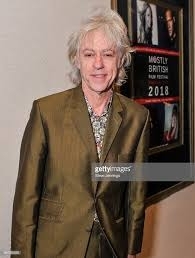 Sir Bob: Days later at the Fairmont Hotel, Republic of Ireland Consul General Robert O’Driscoll hosted cultural power Celts at a brunch honoring Geldof, the former Boomtown Rats frontman and Dubliner whose documentary on poet-playwright W.B. Yeats, “A Fanatic Heart,” had its festival premiere. O’Driscoll also had a shout-out for “Lady Bird” actress Saorise Ronan and her Oscar nomination. Most days now, Geldof is a noted humanitarian and media mogul, oft referred to as “Saint Bob” for organizing the transformative Live Aid concert in 1985. Though he long ago shed his naughty punk rock persona, fans at brunch fondly recalled the transformative power of his music. At that time in Ireland, said Jacinta Tobin, Ireland had 22 percent unemployment and very little hope as a nation. Geldof’s eloquent evocation on his passion for Yeats, one of Ireland’s greatest artists, was grad school dissertation-level stuff. And he highlighted the fact that rather than picking up a rifle during Ireland’s 1916 Easter Rising, Yeats picked up a pen. Later at the Vogue, he engaged in a spirited Q&A with storied rock critic Ben Fong-Torres. But Geldof still wasn’t finished: After the screening of “Fanatic Heart” (also available via Amazon), the rock star joined Bair for a nightcap. So at the Big Four plank, well until midnight, Geldof imparted his advice to Bair for this country: Get rid of the guns. By David Lewis Feb. 7, 2018 Updated: Feb. 9, 2018 10:25 a.m.
San Francisco’s Mostly British Film Festival is marking its 10th anniversary, so expect a little bit of Britain, a little bit of Ireland, a little bit of Australia — and even a little bit of Scotch whisky. The festival, which runs Feb. 15-22, has also amped up its star power this year, with both Bob Geldof (of Boomtown Rats fame) and Joanne Froggatt (“Downton Abbey”) making appearances with their new films. The international, yet neighborhood festival maintains its secret sauce: almost no subtitles. All the foreign films come from English-speaking countries, and all are screened in the comfy confines of the Vogue Theatre, an old-fashioned, single-screen gem in Lower Pacific Heights. Allure: Evan Rachel Wood (“Westworld”) gives a powerhouse performance in this provocative drama about an emotionally troubled woman who befriends an impressionable 16-year-old girl disenchanted with her parents. It’s a trail of broken families and relationships — culminating in a snowy finale that will stay with you. 12:30 p.m. Sunday, Feb. 18, Canada. The Death and Life of Otto Bloom: This mockumentary, which opened the Melbourne International Film Festival in 2016, concerns a memory-challenged man in Australia who lives in a reverse time frame. The screening here will be particularly poignant in the wake of the unexpected passing of first-time director Cris Jones, who died at age 37 in September. 4 p.m. Tuesday, Feb. 20, Australia. Mad to Be Normal: The opening-night film, this biopic follows the adventures of Dr. R.D. Laing, whose communal, holistic, offbeat treatment of the mentally ill made him a counterculture figure during the 1960s. David Tennant delivers a transformative performance as Laing, while Elisabeth Moss, Gabriel Byrne and Michael Gambon round out a strong cast. 7:30 p.m. Thursday, Feb. 15, United Kingdom. Anglophiles bummed about having to wait it out for another season of Netflix’s “The Crown” can tide themselves over by taking in a few indie gems featured at the annual Mostly British Film Festival. Heading into its 10th year, the festival will screen 25 films from the United Kingdom, Ireland, Australia, New Zealand, India — and for a first this year — Canada. Some movies are classics, others are new releases. The program kicks off Feb. 18 with “Mad to Be Normal,” a 2017 biopic starring the magnificent “Broadchurch” actor David Tennant and co-starring Elisabeth Moss. Tennant portrays Dr. RD Laing, an influential Scottish psychiatrist whose unconventional ideas for treating the mentally ill often clashed with the medical establishment. The fest finishes Feb. 22 with “Journey’s End,” based on a stage play and set on the World War I front lines. It stars Sam Claflin and Paul Bettany. Notable guests slated to attend include “Downton Abbey’s” Joanne Froggatt, appearing Feb. 16 for a conversation with Jonathan Moscone as well as a screening of her new film, “A Crooked Somebody.” On Feb. 18, singer-songwriter Bob Geldof will be on hand for a screening of his documentary “A Fanatic Heart,” which depicts the life of the poet W.B. Yeats. 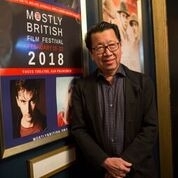 Details: Vogue Theatre, San Francisco; most screenings cost $15; festival pass $220-$225; tickets, schedule and more information at mostlybritish.org. She recently won critical acclaim for her portrayal of a woman who was a victim of sexual assault in the series Liar. And Joanne Froggatt looked undeniably chic as she attended the screening for her new flick A Crooked Somebody at the Mostly British Film Festival 2018 in San Francisco on Friday. The Former Downton Abbey star, 37, stunned in a plunging dark green wrap dress which fell in a waterfall hem. 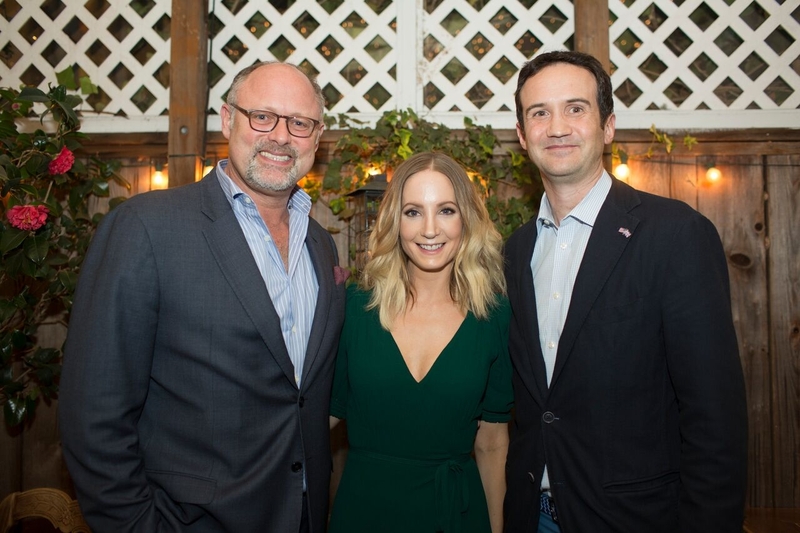 Chic: Joanne Froggatt, 37, attended the screening for her new flick A Crooked Somebody at the Mostly British Film Festival 2018 in San Francisco on Friday. Joanne showcased her sartorial excellence in the figure-skimming number which cinched in her tiny waist with a thin belt before flashing a peek of her lean legs. The TV star boosted her height in a pair of open-toe strappy silver heels and held onto a matching metallic clutch.